Traffic and streetscape changes breathe new life into an urban neighborhood. The 11-block length of Gay Street in downtown Columbus, Ohio is a case study in converting car-oriented, one-way roads into two-way pedestrian-friendly neighborhood streets. 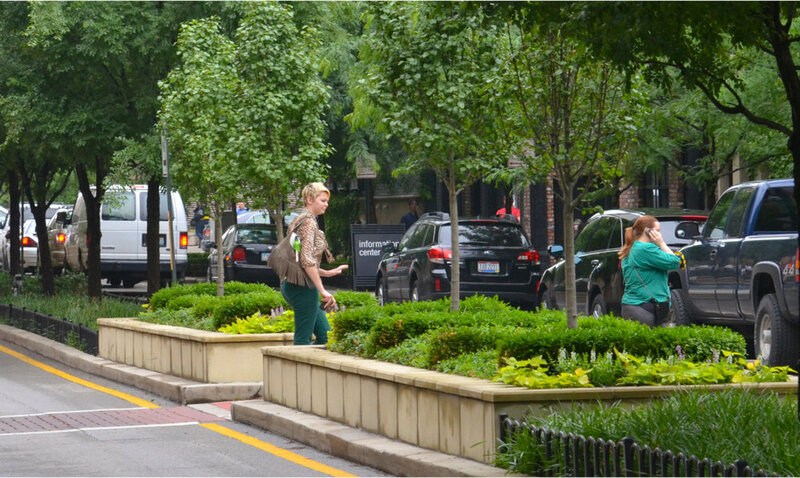 Expanded sidewalks provide a buffer for the outdoor seating areas opened by local restaurants, while a raised urban median that bursts to life each spring with flowering trees slows traffic speed and increases pedestrian safety. Low iron fences add a touch of elegance throughout. Integrated services from planning through design and implementation have resulted in a successful project and the growth of a delightful urban neighborhood that has become an inspiration for similar implementations both locally and nationally. Since plan implementation, the enhanced Gay Street corridor has spurred more than $145 million in public and private investment including new restaurants, bars, residences, and hotels.